The United States Supreme Court is a branch of the United States government and the highest ruling court in the land. The court has two primary functions, granting the final vote or judgment and creating procedural rules for the lower courts. It is made up of one Chief Justice, and eight appointed Justices. The U.S. President appoints the Justices who in turn need to be approved by the Senate. Currently, the Supreme Court bench is one Justice short because of the death of Justice Scalia. The Republican Senate is blocking the President’s appointee in hopes that they will be able to appoint a conservative judge if their candidate takes office in January 2017. This kind of obstruction is unprecedented and may have far-reaching implications. A four to four tie reverts the decision back to the lower court. 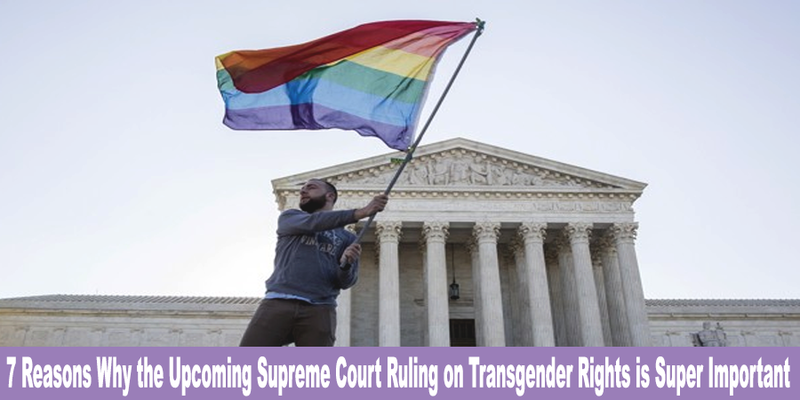 Whether the ninth Justice is liberal, conservative, or moderate will significantly impact human rights cases, particularly those of the LBGT community and specifically transgender rights. The decisions of the Supreme Court which are based on the Constitution cannot be appealed. This situation means the next Supreme Court appointees will impact our lives greatly for the next 25-30 years. The term transgender refers to an individual who identifies him or herself as the opposite gender of their birth. The term transgender replaced the term transsexual in the late 1980s. This change was because a transgender individual can be straight, gay, bisexual, or asexual. The research on transgender individuals is ongoing with hormone levels and brain activity two of the main points of interests. The APA reclassified the term transgender to the less stigmatic category of gender dysphoria in 2013 in the manual. 1993- Minnesota becomes the first state to pass anti-discrimination laws particularly for transgender citizens. 1995 – Transgender woman Phyllis Frye sets up a transgender lobby. 2009- Crimes against transgender people are classified as hate crimes, carrying with them more severe penalties. 2012- It is ruled that Title VII or the Civil Rights Act applies to the transgender community. Gavin has identified as a male for most of his life, and the decision of the School Board has caused him substantial inconvenience and psychological turmoil. The Grimm decision will have lasting implications both psychologically and legislatively on the entire LGBT community. Protecting transgender individuals and the LGBT community from employment discrimination is at risk. Housing rights may also be impacted. Marriage and partner rights including, the right to marry, insurance, financial, and end of life rights may be affected by this court decision. The Grimm decision will further define how Title IX or the gender equality amendment is interpreted. Perhaps the most immediate result of the Supreme Court ruling in Grimm’s favor would be the overturning of legislation in States such as North Carolina and Texas which currently discriminates against the transgender community specifically. The general public consensus appears to favor compassion and equal rights of transgender individuals. This public opinion is illustrated by the outcry and boycotts surrounding the recent North Carolina legislation. Even college and professional sport’s teams have joined to strip North Carolina of business surrounding sporting events. The decision will, of course, be determined by how the Supreme Court interprets the Constitution regarding the Grimm’s case.